Accessing an attic can be particularly difficult, especially if you don’t have a ladder to get there. A fixed stairway could always be installed, but usually this requires difficult installation and a loss of floor space. Not to mention, it is very costly. Therefore, the pull down attic stairs are the best option. Choosing to install an attic ladder to solve this problem is the middle road between installing a permanent fixture and using a standalone ladder every time you access the crawlspace. It will be less costly than permanent stairs, but more expensive than just using a ladder. Click the buttons above for detailed information about each set, or read on for our detailed review of each of the top 3 pull down attic ladders. Our top choice for the best product in this review is the Louisville Elite Aluminum Attic Ladder. This ladder is one of the most purchased online for a reason. It is an excellent product made with quality design and materials, all while maintaining a reasonable price point. While not the least expensive or absolute highest quality, this stair set is overall the best you can buy, getting high marks on all of our ranking criteria. One of the first things to impress us about this model is the intelligent design. It features a wide clearance that will make carrying boxes into and out of the attic a breeze. As well, the door is operated by gas cylinders instead of the typical spring set up. This has two advantages. First, the smaller design increases clearance, which we mentioned above. Second, it makes opening and closing the door much easier. The manufacturers really had the customer in mind when they created this product. The Louisville Elite is made with high quality aluminum, making it light enough to easily pull down and lift up, while being strong enough to hold most people along with a load to store in the crawlspace. The weight limit is 350 pounds. This ladder will agree with almost all spaces, working with ceiling heights of 7’9″ to 10′. In addition to being one of the most purchased models online, it is one of the best rated. Receiving almost 300 four-star or better ratings, customers were extremely pleased with this purchase. One buyer commented that it was “plenty sturdy”. The Louisville Elite is an excellent product that can be bought at an amazing price. Being the ultimate combination of economy and practicality, this was by far our top choice. 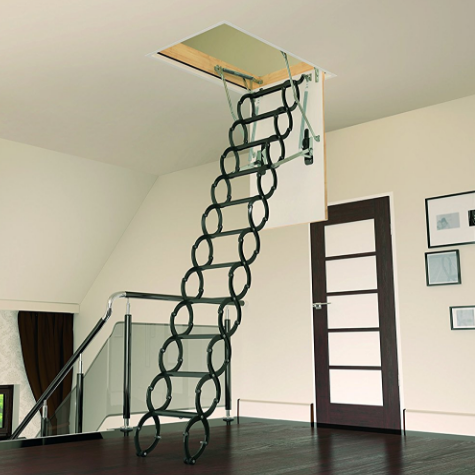 Our next option in this selection of attic stairs is the Werner Aluminum Attic Ladder. This budget friendly option surprised us with how high quality it was for the low price. While certainly not the best on the market, this is a great option for people that don’t want to spend a bunch. We found that this model is best for people who need attic or crawlspace access irregularly. 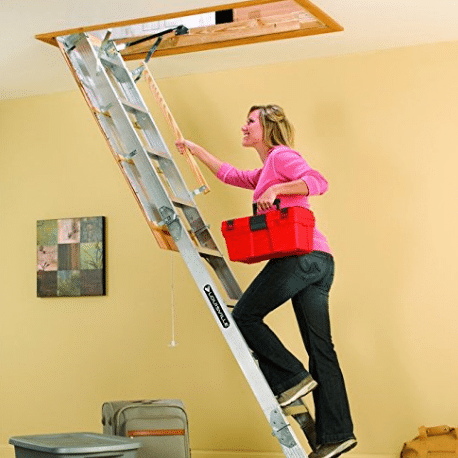 The Werner attic ladder is made of lightweight aluminum, giving it an extreme light weight. The down side to this is that the ladder is not very strong. In fact, it is only rated for holding up to 250 pounds, which may or not be enough depending on your needs. People carrying heavier loads may need to look to another option. One thing that impressed us about this product is the inclusion of an assist pole, which makes it easier to bring the ladder down to the floor. This may come in handy for people with tall ceilings. The ladder works with ceilings from 7ft 9in up to 10ft. 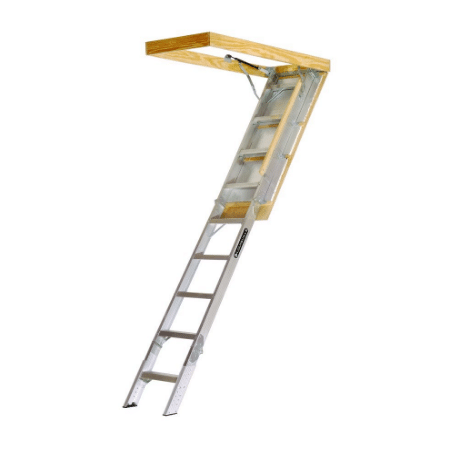 One of the features of this attic ladder is a low profile opening, which may be a plus or minus depending on the needs of the user. This will make it harder to fit larger objects through the hole. Although, it will make it better for use in tight spaces like hallways. While not as highly rated as the previously reviewed model, most people were satisfied with their purchase of this product. One product user summed up this product well saying “good option for a ladder for a smaller or irregular attic access”. While not as good as the Louisville Elite, the crazy low price, makes the Werner a solid option. 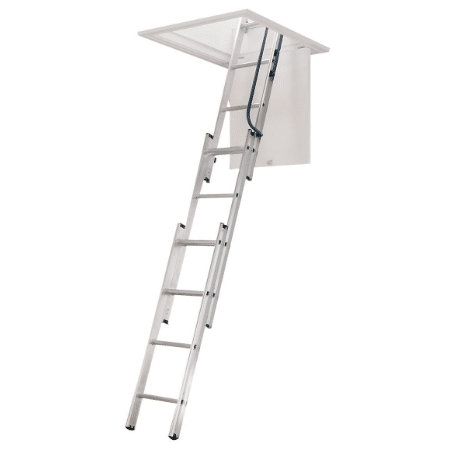 WERNER LADDER AA1510 AA1510B Ladder Aluminum Attic 250 lb. 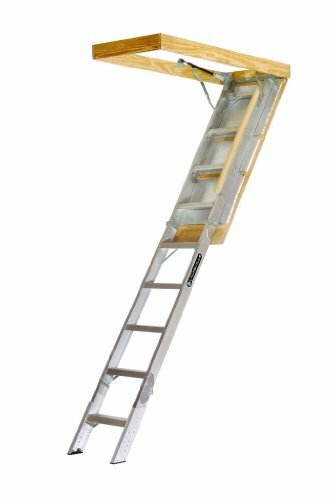 The third and final item in our review of pull down attic stairs is the Fakro Steel Scissor Attic Ladder. While being placed last on our list, this product is actually the highest quality. The reason we placed it third is because it is very pricey, and most people will probably not need an attic ladder this good. The Fakro is like the Rolls Royce of attic ladders. It is an extremely high quality product, but it is expensive and not needed by most people. If you have a high budget, read on to find out what this incredible ladder offers. The Fakro Scissor ladder has two things that you don’t see in most models. First, it is built with a highly durable steel set of stairs. This will make the stairs last a lifetime, and is even backed by a two year warranty. Second, it features s-shaped rungs, giving it a stylish and modern look that will fit into any house. These rungs not only look good, they offer function as well, providing a railing for climbing up and down. It looks so good that you may want to keep it permanently extended. The trap door on this model has great insulation ability, even offering an R rating of 5.2. This may help you recoup some of the money you spent on it! While closed, the door looks better than the other models, with a low-profile handle. This model was highly rated by purchasers, with one calling it “well designed and engineered”. But a some people raised concern that the opening to the attic was a little small. If you have the budget for the expensively priced Fakro Scissor Ladder, it is definitely worth it. 1. Pick the spot where you want to place the attic access. While choosing the spot, care needs to be taken not to cut into a spot that has electrical wires, plumbing, or structural support. As well, make sure that the dimensions of the ladder or stair part will work with the space. Some models do not pull straight down, requiring a longer stretch of space for operation. 2. Mark and cut the spot on the ceiling where the hole will be cut. Outline the exact dimensions of the attic door with a pencil, to make it easier when cutting. Obviously, if there is already crawlspace access, this step can be skipped. 3. Attach the attic door frame with the method described in the included instructions. 4. Attach the trap door to the frame. 6. Attach handles, railings, and any extra accessories. 7. make sure everything is tightened up and operational before putting weight on it. Pull down attic ladders can offer many advantages to the home owner. They save on space, time, and money. Installing one in a house adds tons of value and practicality. We think everyone that has an attic and a few dollars to spend should get one. Copyright © 2019, HoistNow.com. All rights reserved.